Until very recently, buying and changing a lightbulb was a simple task. The only choices were screw-in or bayonet fittings and specifications of wattage. It only got more complicated if you decided to venture into the world of coloured bulbs and even then the limited range meant little more than wondering what a red or blue bulb would look like illuminating a room (not well if you were wondering!). However, things have changed and now the lightbulbs we used during our lives have all but disappeared and swiftly replaced with an often confusing array of new alternatives. Why can’t I find the light bulbs I’ve always used over the years? Traditional lightbulbs – known as incandescent tungsten bulbs are now no longer on sale in the UK. This is as a result of an EU directive to save energy and lightbulbs as we knew them started to disappear from 2009. In August 2012 a complete ban came into place on the sale of any wattage of this style of lightbulb. Before the phase-out started, there were 200 million incandescent bulbs sold in the UK each year and there needed to be replacements available to buy before the ban came into force. The first ones available were called compact fluorescent lamps (CFL), which were marketed as being energy efficient and most looked like a long coil. They were initially very popular as households prepared to switch over to save energy to help the planet and also spend less money on their electricity bill, but in reality these first generation designs were a disappointment; they took a long time to reach full illumination (sometimes as long as 3 minutes) and the quality of the light was really poor. Many people gave up and went back to incandescent bulbs, yet after the ban there was no choice but to look at alternatives. Technology and science moved swiftly to solve the problem and a number of different lights for different settings and uses quickly started to appear on the shelves. The transition was so fast though that many people just didn’t – and still don’t – know what they are buying and if it was the right choice for the room or the lighting. When should I use a CFL ? Whilst the CFL was the first attempt at an energy-efficient bulb and wasn’t overly a success, it paved the way for the future as they are much brighter and light up faster. You would use a CFL around the home for replacing bulbs in ceiling fittings. They are four times more efficient than incandescent bulbs so quickly pay for themselves in savings as they are very cheap to use. However, check to see if you like the light they emit before committing to changing every bulb in the home as it’s not for everyone. Why would I need halogen bulbs? If you want to replicate the brightness of an incandescent bulb as you aren’t keen on the illumination of a CFL, halogen bulbs are the solution. They aren’t particularly energy saving, can be rather expensive and their expected lifespan is only around 2 years, but if you want the same look as your old bulbs gave around the home, these are the ones for you. I’m hearing a great deal about LED lights – tell me more please? Using over 90% less energy than incandescent bulbs, LEDs are perfect for energy saving. They are relatively more expensive to buy but are gradually coming down in cost and can last up to 25 years, meaning they are the cheapest option in the long run. They are now very popular for using with spotlights and downlights. Don’t be scared by the fact that there are hundreds of different fittings available. The reality is that every home will only have a few different fittings you’ll need to think about. 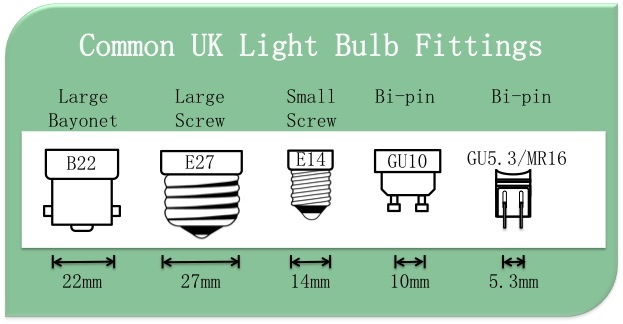 If you need a bayonet then the fitting code will start with a ‘B’ and if it’s a screw-in it will start with an ‘E’ – for Edison Screw, the official name for a screw-in bulb and named after inventor Thomas Edison. 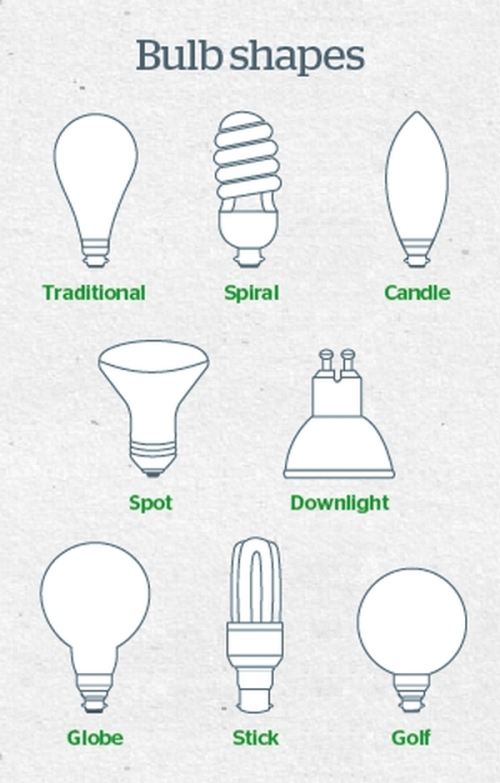 Don’t choose a lightbulb shape just because it’s pleasing to the eye as the different shapes are designed to throw the light in different ways. For ceiling pendants where you want light to shine in all directions equally, choose either the arbitrary, stick or spiral shapes as this is what they have been created to do. For lamps, use candle bulbs which have a focused but broad spread of illumination. Spotlights are installed as recessed downlights, which have the reflector style and the best beam width for the job. I understand watts, but how do I recreate the same amount of brightness with the new bulbs? 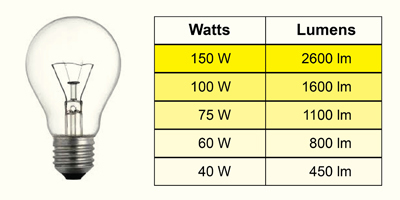 In terms of labelling the brightness of a bulb, watts are now part of the past and are not used anymore. The term now used is ‘lumens’ and the more lumens, the brighter the bulb. Most UK homes used 40W or 60W incandescent bulbs and to give a guide as to the equivalent needed, 40 watts is the equivalent of around 400 lumens and 60 watts is around 700 lumens. LED lights are the only exception to replacing wattage with lumens as they can be very bright so you’ll need a lower number of lumens than you think to give the equivalent amount of light, but this is down to personal taste. Kelvin isn’t someone you’ll need to talkto about your bulbs when you buy them. Kelvin is a measurement of temperature and refers to how warm or cool the light will be when you turn a light on. Don’t worry if you dreaded physics at school, all you need to remember is the cooler the shade of white of the light, the higher the kelvin rating. Cool lights are more akin to natural daylight. Most living areas will want a ‘warm white’ to replace the feel of incandescent bulbs and this is a kelvin rating of 2700k. For kitchens where you need more natural light choose ‘natural white’ at 3000k but if that’s not enough, choose ‘cool white’ at 4000k. Now you know more about the bulbs and why you can’t find a 60W bayonet anymore, here’s a round-up of what you need to know when you next go shopping. Temperature: How cool do you want to be? You may need to experiment to begin with – particularly with the number of lumens and temperature to get the perfect light for each environment, but armed with this guide you should now be able to make an informed choice. Keep it simple, use these tips and you’ll soon realise that choosing light bulbs is straightforward and impress your friends with your newly found scientific knowledge of how to change a lightbulb.